We all know very well that recently we have seen the release of the latest version of Android, of course, Android 8.0 Oreo. It is the Google’s Android mobile operating system, which would be arriving soon on Pixel devices and then later on other smartphones. However, now speculations about the next Android version, Android P is already started appearing and not only that even Google already working on it. Recently we have seen the release of the latest version of Android, of course, Android 8.0 Oreo. It is the Google’s Android mobile operating system, which would be arriving soon on Pixel devices and then later on other smartphones. However, now speculations about the next Android version, Android P is already been started appearing. As every year, by this time, the tech giant Google has presented its latest version of the Android operating system, Android Oreo 8.0. We all know the problem of fragmentation that Android has, but it is something against which we can do practically nothing, except choose with the magnifying glass the model of smartphone that we will buy, based on whether it will be updated soon or not. Although virtually if anyone has Android Oreo – not even Android Nougat, the tech giant Google would already be working on the ninth version of Android, of course, the Android P. What will be its name? What news will it have? 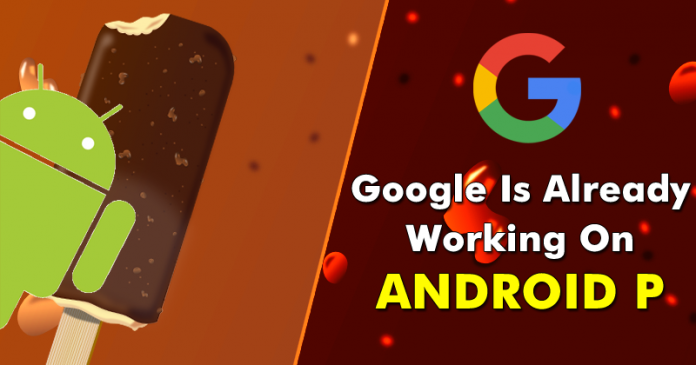 As we read in TheAndroidSoul, developers have found information in the AOSP code Android Open Source Project for Android P, which would be the new version of the tech giant Google’s mobile operating system. Obviously, these are a few changes in the code that suggest to this new version, but nothing is known about the final name, the changes that will bring, nor its features. Android Oreo still has enough development to be a 100% polished system, but we are happy to know that the tech giant Google is already working on the next version of Android that will appear. As always, we will have to wait to see if it is true that Project Treble allows us to update faster to a higher version if we come from Android Oreo, only time will tell. So, what do you think about the next version of Android, Android P? Simply share your views and thoughts in the comment section below.